The federal agency charged with reporting and deciphering educational statistics recently offered a dire analysis of the competencies of American adults in basic educational tasks when compared with peers in other developed nations. The Program for the International Assessment of Adult Competencies is an exam that measures skill in numeracy, literacy, and problem-solving in technology-rich environments among adults in many free-market, democratic European nations, as well as in Japan, South Korea, Canada, and the United States. The National Center for Educational Statistics will typically follow up with a first look at how the PIAAC measurements reflect on the U.S. populace. The results of the 2012-2014 measurements suggest that American adults’ skills are no more impressive than those of U.S. youths, who have not fared well in some international comparisons of academic performance. American adults of nearly every age group and employment status struggled to match their peers in tasks that involved calculating computations, proportions and percentages, as well as technological tasks such as sorting emails, performing Internet searches, and managing spreadsheets. 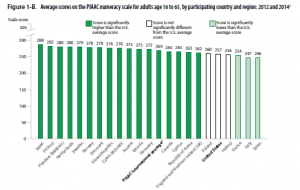 The international PAICC reviews achievement among adults across a wide age group, 16 to 65. The U.S. report also provided additional research on Americans aged 66 to 74 and those in “subgroups of interest” such as incarcerated and unemployed American adults. An EdWeek opinion contributor, Marc Tucker, recently discussed the report’s findings on the Top Performers blog in the context of the increasingly competitive global labor market. One potential silver lining of the report is a finding that the United States has a slightly higher percentage of adults that score at the highest levels on literacy tasks compared to international norms. These high performers are, however, offset by a disproportionate number of adults who score at the lowest level. The wide distribution in U.S. literary achievement likely has to do with persistent gaps in educational opportunities between whites and minorities, suggested another EdWeek opinion contributor, Robert Rothman, in an online post. In addition to measuring differences in achievement along racial and ethnic lines, the report broke out results for respondents based on level of educational attainment, age, health, gender, and other metrics. The image used in this story is a screenshot taken from the NCES report.